villas, private secluded homes, privately owned cabanas, Honduran casa. Roatan vaction rentals at Sundancer Cabanas is the most ideal approach to take in all of Roatan. Why book your get-away with Us? Save Money, Save Time and Premium Location. You are a VIP visitor where unwinding is our priority. Sit back, unwind, and take in the Caribbean air — your private cabana getaway home is here! 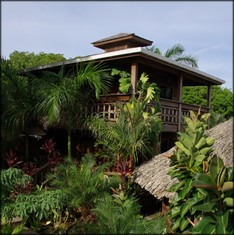 Offering unique eco-lodge Roatan vacation rentals at a very affordable price. Made from Honduran materials and set amongst lush tropical gardens we have captured the authentic feel for you to experience. Swaying in a hammock on your spacious deck admiring the panoramic view of the caribbean, you will be able to relax an rest in comfort. Enjoy our on-site ocean view restaurant & bar & private swimming pool. If you wish, why not enjoy snorkeling, kayaking, diving and boat trips all one-site. We look forward to welcoming you at Tranquilseas. Experience Roatan, off the coast of Honduras and come "Dance in the Sun" with us at Roatan Beach Front. Escape in our 4 comfortable and clean privately owned Sundancer Cabana homes where relaxing Roatan vacation rentals are premium! Get away from hotels, condos, and busy accommodations; to a tranquil, relaxed, simple, vacation "Island Style". Enjoy our unique jungle property and pristine coral reef. Roatan Beach Front offers you a private vacation with a personal touch! Come, Experience Roatan vacation rentals in the Sun Drenched Crystal Clear Waters of the Caribbean! Roatan vacation rentals: Georphi's Tropical Hideaway and Rudy's Restaurant in the tranquility and unspoiled world of the Bay Islands, Honduras. Experience a dimension where time slows down, and the stress of everyday life is swept away with the crystal clear waters of the Caribbean. You owe it to yourself. Come stay in our Roatan vacation rentals with us and make unforgettable memories as you experience Roatan island in the Bay Islands of Honduras. Experience our island style website! Enjoy adventure articles, photos, slide shows, tourist adventures, restaurants, tours, scuba diving, gift shops and much more! Escape to pristine beaches, coral reefs and participate in the island culture. Roatan vacation rentals are here for your adventure.